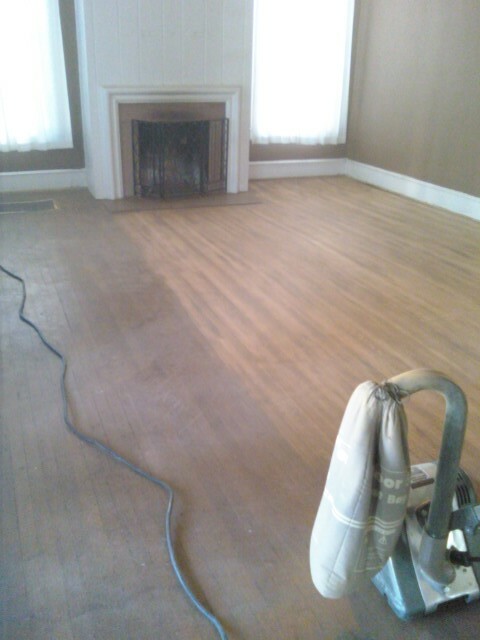 I’ve been over to the house a few times this week to keep sanding and sweeping. Doing an hour or two of work on my knees after working in the hangar all day is rough! 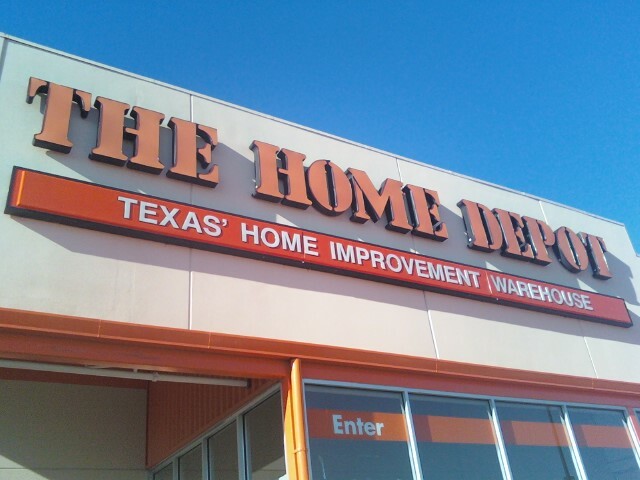 I do believe that doing a little work after real work will be much easier once we are living there, though. Getting dinner, running to the house for a bit and then coming back home to help with Jack’s homework has been exhausting. 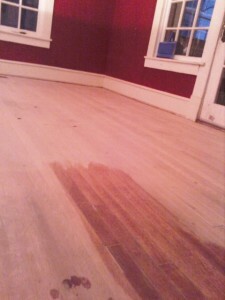 As a result, we are a bit behind in the floor refinishing. No worries, though. It will get done soon enough. I had a bit of a panic when I realized the hole filler stuff I put down was meant to be put on before the final sanding instead of after. I managed to wipe off most of the extra goop. It came off (mostly) with some water and elbow grease. You can get a little foretaste of what the stain will look like where the floor is wet from washing it. Today I took a palm sander to some of it and it came off better, so I think I will go back over it all before the staining begins. This process is taking much longer than I had hoped. 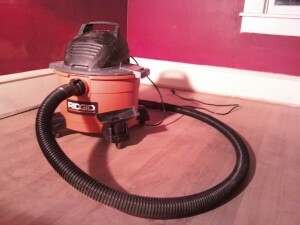 Mostly because of the monster edge sander. I am going to have to blend the edges into the main floor a bit with the palm sander, but it will be totally worth doing. 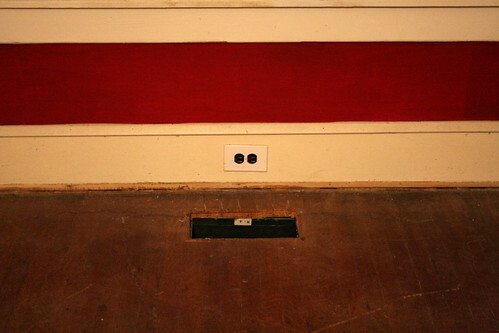 I want this floor to last at least five or six years, if not longer. And I want it to be exquisite. These are the first rooms anyone will see and the main entertaining space of the house, so it will be a serious focal point. Sounds kind of silly, but consider that Ellen and I want to open our home to friends and create space for real living in real community. 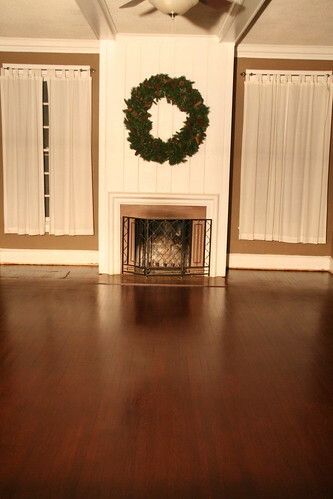 If a really beautiful floor helps people feel at home in our home, then the extra effort is worth the trouble. Two discoveries from this evening, one good and one bad. 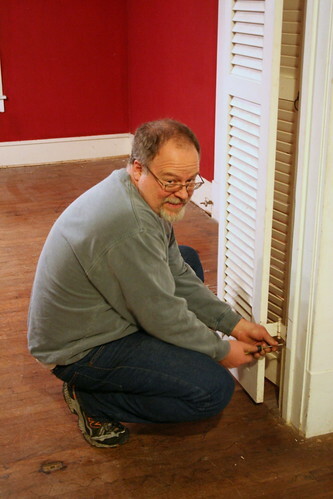 First the good: in taking off louvered doors, we discovered that the trim around the doorway between the living and the dining room only has a couple of coats of paint. I’m planning on stripping it tomorrow as a test for the rest of the (painted) woodwork downstairs, which we’d like to eventually strip all of. Now the bad: we pulled up the carpet in the downstairs stair landing and discovered that what we thought was carpet over linoleum over wooden floors is actually carpet over linoleum around the edges and big chunks of plywood and broken boards. 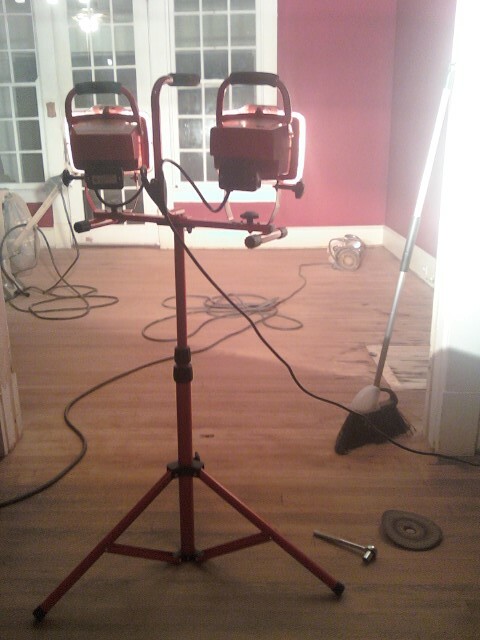 We are still pretty sure that the stairs and the rest of the floors upstairs have floors in good shape, and the landing is only 4′x8′ so it won’t be too cost prohibitive to install hardwood there, but still, it was a bit of a blow. We had to stick the carpet back down and leave off for now. 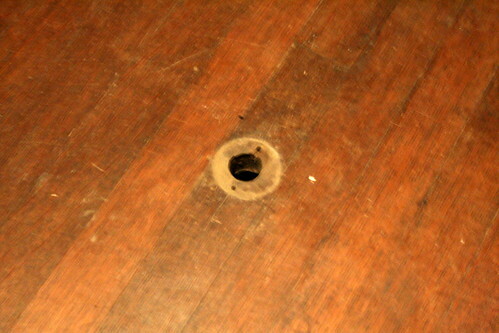 Random hole in the middle of the dining room floor, that had a strange circular grate on it. What was it for?